In 1951, after much hesitation over the site and form of a new shopping precinct in the centre of the devastated city, Van den Broek & Bakema were commissioned to design 65 shops. These were built in two levels along two intersecting pedestrian streets. Unlike the traditional Dutch shopping street, dwellings and office space were not placed above the shops but behind them in separate blocks. The street profile, rather than being tall and narrow, is accordingly low and broad. The shops have a concrete frame, allowing for flexible subdivision of their interiors. Partition walls are of brick. As a rule one shop consist of two levels (above a basement), with three levels for staff at the back. All shops are 15 or 20 metres deep, but of varying width. The facades are built up of prefabricated concrete posts and panels using a basic module of 1.1 metres. Awnings composed of steel girders hung from the concrete frame and finished in varnished red deal, extend along the facades. Arcades at various points, kiosks, display cases, plant boxes and paving together model the pedestrian precinct. All shops take in stock from a service road at their rear which also functions as an access road for the precinct's housing. This is contained in blocks of three, thirteen and nine storeys respectively, each enfolding a communal green space. In 1966 the Lijnbaan was extended to Binnenwegplein, there to join up with another key shopping area dominated by two more retail buildings by Van den Broek & Bakema: H.H. de Klerk, and Ter Meulen/Wassen/Van Vorst. 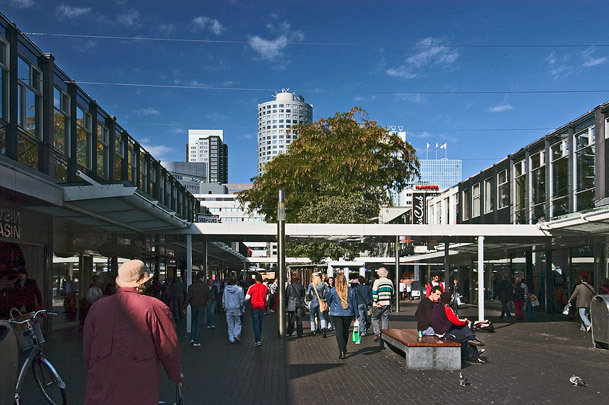 As the prototype of a traffic-free shopping centre, the Lijnbaan has been imitated all over the world. Its unique urban layout of pedestrian precinct, service road and high-rise housing off courtyards has produced one of the few successful forms of urban dwelling, a form seemingly able to absorb without effort even the vast office slabs of the 1970s. The flexible subdivision of shops, simple systematic architecture and thoughtfully shaped pedestrian street have managed to survive several generations of interior designers and shop decorators. In 1996 the original awnings were superseded by a new, more transparent variant to a design by the firm of Van den Broek & Bakema.